-- "In order for humid tropical agriculture to be both highly productive and sustainable, it must imitate the highly productive, millions-of-years-old humid tropical forest" -- Roland Bunch, "An Odyssey of discovery: principles of agriculture for the humid tropics", ILEIA Newsletter Vol. 11 No. 3 (October 1995): "We Love Weeds"
Agroforestry integrates trees with farming, such as lines of trees with crops growing between them (alley cropping), hedgerows, living fences, windbreaks, pasture trees, woodlots, and many other farming patterns. There's nothing new about it -- it only seems new because modern industrialized farming ("commodity extraction" rather than farming) has veered so far from true farming practices. The heavy machines and single-crop production lines are tree-unfriendly. Previously, many traditional farming systems all over the world integrated trees with crops and livestock, and many continue to do so. The traditional European mixed farm with its crop and livestock rotations over the land was alive with trees, in hedgerows, pastures and woodlots, lining lanes, around homesteads. Such farms are still to be found in many parts of Europe. Now agroforestry is perhaps the fastest growing sector of the sustainable farming movement, in both the developed countries and the Third World. Agroforestry increases biodiversity, supports wildlife, provides firewood, fertilizer, forage, food and more, improves the soil, improves the water, benefits the farmers, benefits everyone. agroforester.com -- Resource for Tropical Forestry and Agroforestry, based in Hawaii -- Publishes the Overstory free email journal for agroforesters, gardeners and others. Back issues online. Forest management plans, agroforestry plans, tree seedlings, tree seeds and plant inoculants (mycorrhiza and rhizobium), training and education workshops. Free publications: Nitrogen Fixing Tree Start-up Guide, Guide to Orchard Alley Cropping, Multipurpose Windbreaks, Multipurpose Palms, Forest Technology Bulletins, Sheet Mulching, more. Agroforestry links. Site search. Association for Temperate Agroforestry -- Agroforestry uses combinations of trees with crops and/or livestock in an integrated agroecosystem. Agroforestry overview, alley cropping, windbreaks, riparian buffer strips, silvopasture and forest farming. 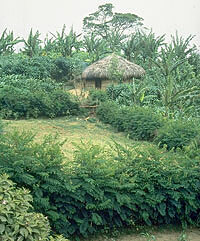 Agroforestry articles online, links and resources. Publishes the Temperate Agroforester quarterly newsletter -- articles about agroforestry research, demonstration, education, public policy, and government programs, news, events, new publications, Internet resources, networking. Back issue index of articles, order online. FACT Net was an international network of community groups, development workers, tree breeders, researchers, students, and farmers, with 2,000 partners in 100 countries devoted to the use of multipurpose trees to improve the soil, protect the environment, and enhance the well-being of farm families and other land users. Originally the Nitrogen Fixing Tree Association (NFTA), which provided the skills and resources necessary to use nitrogen fixing trees for sustainable agriculture and environmental protection to thousands of people worldwide. FACT Net closed in 1999 after nearly 20 years, the web site is maintained as an on-line resource and for ordering FACT Net publications. FACT Net News online (up to September 1999), large online collection of FACT sheets on multipurpose trees, research reports, field manuals, seed sources, resources and links, Agroforestry Practises Slide Show (20 slides, with explanatory notes). USDA National Agroforestry Center -- A partnership of the USDA Forest Service, Rocky Mountain Research Station and the USDA Natural Resources Conversation Service to promote agroforestry development. Technology Transfer & Applications, Research & Development, International Technology Exchange. Publications, information and resources. it's strong, light, and flexible, so it doesn't blow away in typhoons. On a small farm, bamboo is extremely useful. Small farmers who depend on it (you soon will) plant at least two varieties. Most varieties flower every 30 years, others every 15, 45, 60, or even 120 years -- always in multiples of 15 years, for some reason. Then it dies back for five years or so -- no bamboo. So you need different varieties. All bamboo plants of the same variety, wherever they might be in the world, flower on the same day. Just think of that. Apart from the poles, bamboo leaves make fine hay with a high protein content. And bamboos are beautiful, the groves make lovely creakings in the breeze. Its infinity of uses is only limited by the imagination. Rudolf Diesel's first compression ignition engine was inspired by a traditional firemaker tribesmen made from bamboo. One bamboo website lists "Uses of bamboo". It might be easier to list things you can't use it for. Bamboo is not just a tropical plant, there are varieties for most climates -- there are more than a thousand varieties of bamboo (and they've never been crossed, because of their weird flowering habits). Bamboo: A Multipurpose Agroforestry Crop by Steve Diver of Appropriate Technology Transfer for Rural Areas (ATTRA) -- information and resources on bamboo agroforestry from ATTRA, particularly in temperate regions. Bamboo and Rattan Facts from the International Network for Bamboo and Rattan (INBAR) -- "A single bamboo clump can produce up to 15 kilometres of usable pole (up to 30 cm in diameter) in its lifetime." Bambus-Centrum is a German site, worldwide bamboo links. Lewis Bamboo Groves in Alabama has over 80 varieties of cold-hardy bamboo. Burt Associates says there's a bamboo suited for every climate and has an online MiniGuide to Bamboo with plant descriptions and pictures. Online orders. jmbamboo Bamboo Nursery -- US-based nursery supplying cold-hardy bamboo for screens, gardens, and landscapes. Most are spreading, evergreen bamboos, ranges in size from tiny groundcovers to towering giants, also rare or hard to find bamboos. Books on bamboo, FAQ, good information on how bamboo grows, planting and growing, controlling bamboo, what to do if it flowers, more.